Reopened in 2009, Sunnyside Conservatory features the "Live @ the Conservatory Concert Series," a wide-ranging, locally-produced, non-amplified music series that showcases the great acoustics in the restored Conservatory. The Series is co-sponsored by Friends of Sunnyside Conservatory and SF Recreation and Park Department. Doors open one hour before concert. A $15-20 donation is suggested. The surrounding garden is open from dawn until dusk. 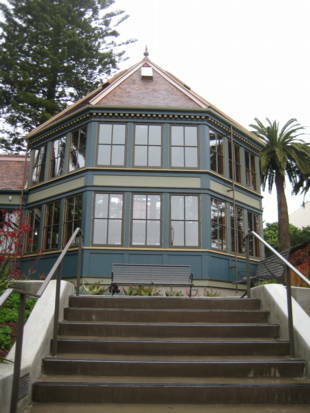 Sunnyside Conservatory is owned by the San Francisco Recreation and Park Department. It's still there. The beautiful, 100-year- old landmark on Monterey Boulevard has survived six owners, the 1906 earthquake and is sometimes known as 'the other conservatory.' In 1891, H. Taylor bought the seven lots on which the conservatory is located from the Sunnyside Land Development Company and later sold them after erecting the still-standing Victorian. Around the turn of the century, the new owner, W.A. Merralls, constructed Sunnyside Conservatory at a cost of $7,000. He installed concrete walkways, landscaped the grounds, planted trees inside the building to complement those outside, and added an observatory tower to the house. Merralls was killed in a train accident in 1914 and, with his company heavily mortgaged the bank foreclosed on the estate. In 1919 Ernest Van Beck and his wife purchased the property for $12,000. Believing that it contained only the house and thickly- foliaged land, they were surprised to discover a concrete walkway and the conservatory it led to. The Becks restored the building and grounds but sold the estate to the Walter Andersons following the death of Mr. Beck in 1953. A series of owners followed the Andersons and resulting structural decay and vandalism had taken their toll on the conservatory. In 1975, through the persistent efforts of the Sunnyside Neighborhood Association and Ken Hoegger, the conservatory won landmark status although the owners had already partially demolished the building. In 1980, Sunnyside residents and Open Space Committee members appealed to the Open Space Committee to acquire the conservatory and won approval for acquisition. (Sources: The Sunnyside District by Thomas W. Malin c 1976 and conversations with Friends of Sunnyside Conservatory). The .19 acre conservatory site was purchased with money from the Open Space Fund for $226,000 in 1980. Another $200,000 was allocated for restoration, landscaping, and installation of an irrigation system. Dry rot and scale had so destroyed the wood in the building that restoration quickly turned into reconstruction. 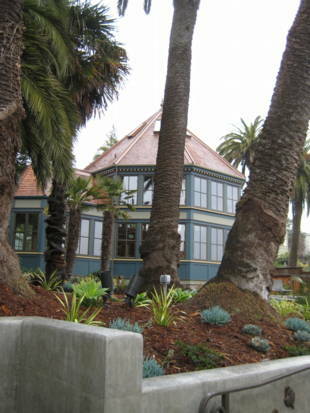 The partially finished replica of Sunnyside Conservatory's octagonal redwood structure was completed in 1986. Today the grounds are covered with exotic cloud and rain forest plants surrounded by grand palms, many from Merralls' original planting. Fourteen years of vandalism and a lack of maintenance and irrigation are now being addressed by Friends of the Sunnyside Conservatory. Arnold Levine organized the group as an activist arm of the Neighborhood Association in 1999. Having secured a $9,750 grant from Friends of Recreation and Parks, they plan to install signs, a notice board, benches and trash containers. With an additional $5,000 grant from San Francisco Beautiful, new fencing will be installed. Bi-monthly workdays are devoted to clean-up, plant restoration and maintenance of the new butterfly garden. 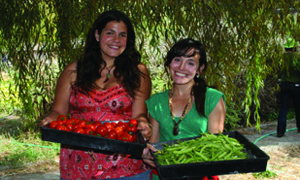 On the educational side, the Friends are working with Glen Park Elementary School designing events and visits for children and with nearby City College, where department heads of horticulture, photography, and botany are keenly interested in jointly developing projects. On the drawing board is an outdoor, artists-in-residence program for art relating to the Conservatory and grounds. The Conservatory is open every day from 9 a.m.-6.p.m. and welcomes the community to events, like tea parties and story time for children. 'In restoring this neighborhood jewel for our community, we also plan to attract and surprise visitors from all over the city who come to discover it,' Levine declares. For inquiries about reserving the Conservatory for community or private events, call 415-831-5500 or email Amanda.Lee@sfgov.org in the Recreation and Park permits office.